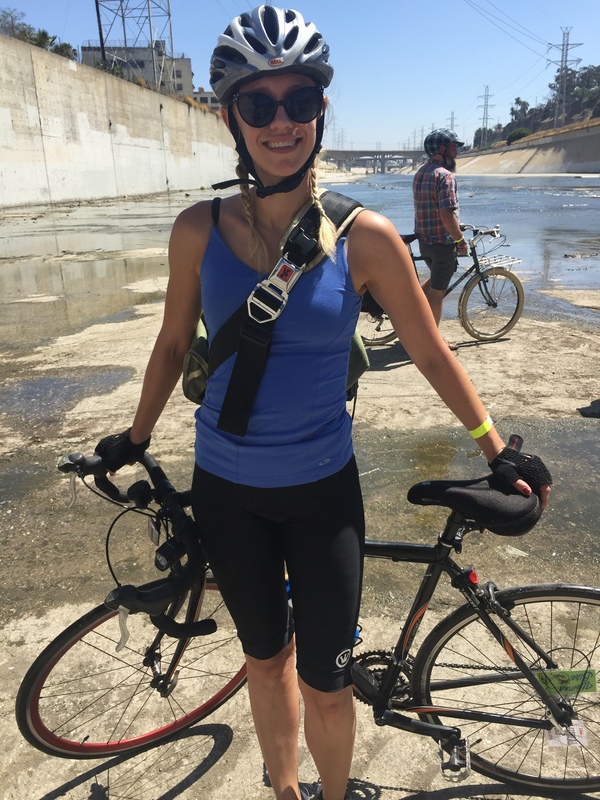 This Sunday I joined the Los Angeles Explorers Club with my friend, Mary, on an intense bike ride through the Arroyo Seco. I’ve been wanting to check out one of their curated rides since I heard about the group earlier this year. Their rides explore the history and culture of the city, and delve into those mysterious corners of the city. If you’ve ever wondered why there is a staircase that appears to go to nowhere, or a strange sidewalk next to the freeway, the LA Explorers Club probably has an answer to that. There are few things I love as much as biking and LA history, so I was really looking forward to this. 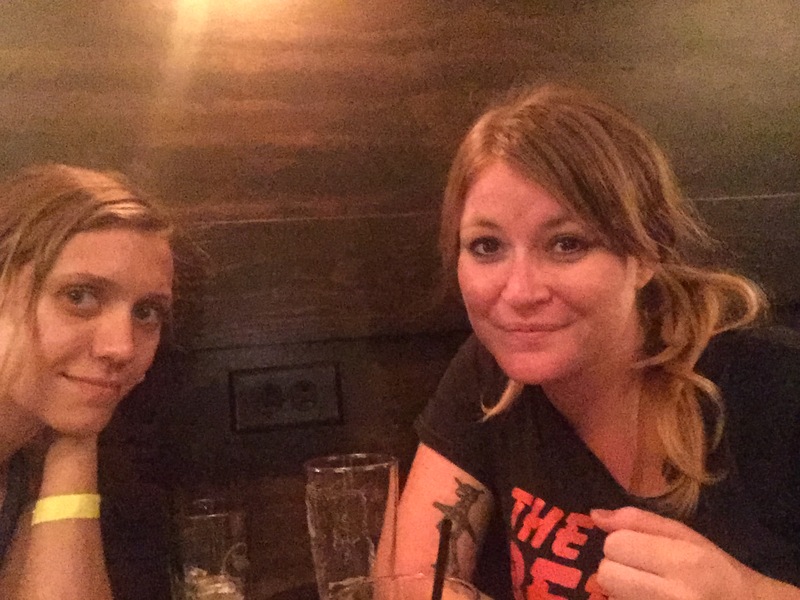 Mary and I met at MacArthur Park around noon and set out to the ride’s meet-up location at Barbara’s at the Brewery. Our $20 admission made us members of the Los Angeles Explorers Club and scored us some pretty cool swag, including a tote bag and an Explorers Club patch for our bike bags. Oh, and did I mention three New Belgium beers? Mary and I are ready to roll out! After Mary and I had a pre-ride brew and split an order of Barbara’s tater tots (man, those were some good tots! ), we rode out with the group. We were warned ahead of time that this wasn’t a ride for the novice cyclist. It would be mostly uphill and through various terrains. Mary and I both do a fair amount of riding, so we were excited for a ride that would challenge us. This was definitely a fair warning! We began going through a narrow stretch of road where cars couldn’t pass us, and then carried our bikes up a ramp to a sidewalk along the 110 North. I remembered seeing this fenced-in sidewalk next to the freeway and always wondered why it was there, and how one would even get there. I learned on this ride that the sidewalk was there back when that stretch of the 110 was Figueroa Street. Our first stop was the Los Angeles River confluence. That portion of the river is near one of the first Spanish settlements. Even though the river is now nearly dry, this portion of the river is one that always remained above ground. 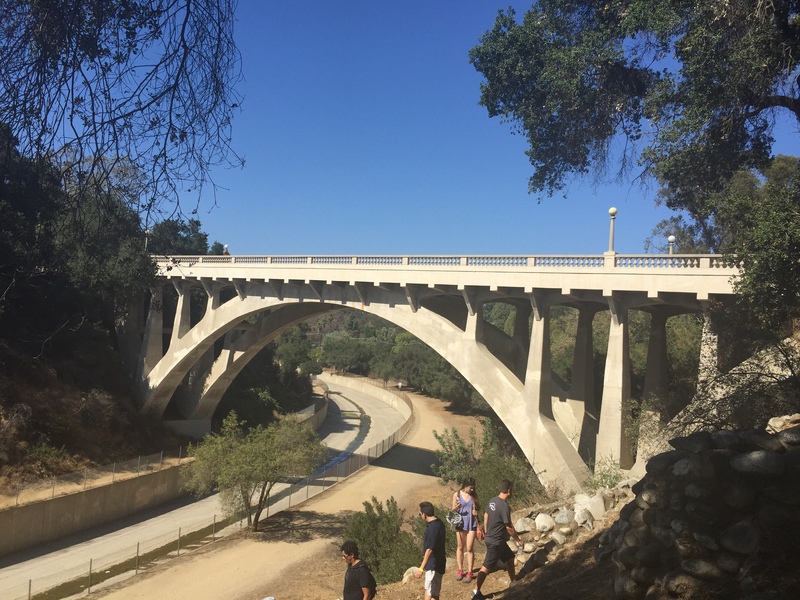 We learned that the LA River used to be mostly underground due to the bedrock. Since the water was exposed here, it made for a really good spot to settle. First pit stop at the LA River confluence. 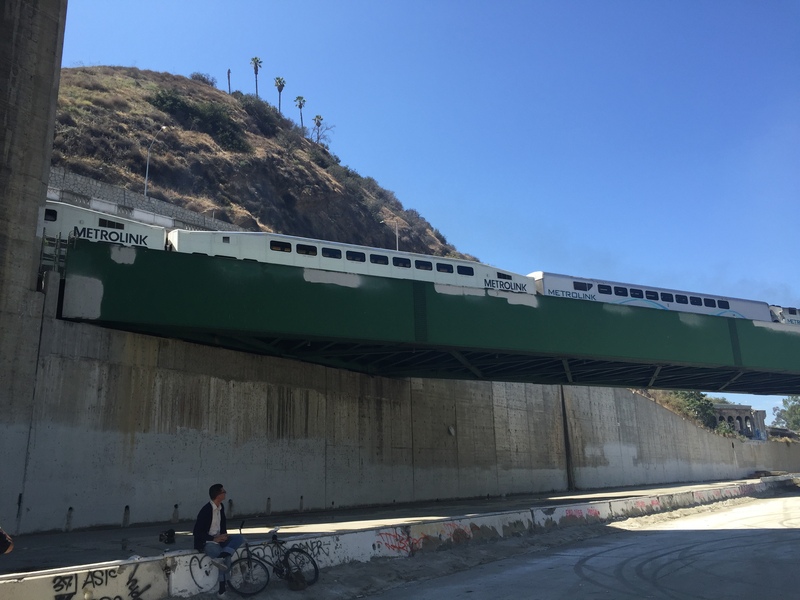 A Metrolink train passes by the LA River confluence. We then continued north through Cypress Park to Lummis House. There, we learned about the eccentric Charles Lummis and his influence in making Los Angeles and the Southwest region of the United States what they are today. We toured the beautiful gardens surrounding the house, and took a tour of the beautiful stone craftsman house that he build by hand. 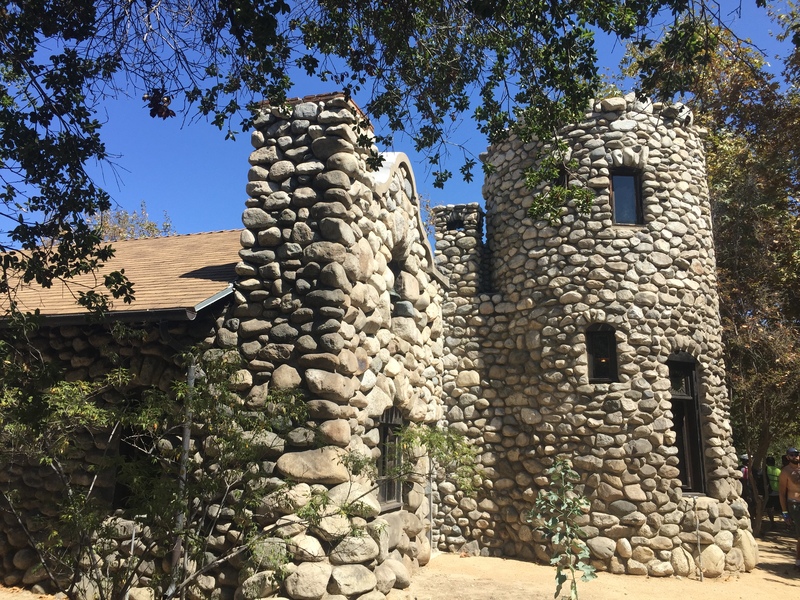 Exterior of the beautiful Lummis House, build nearly entirely by Charles Lummis. 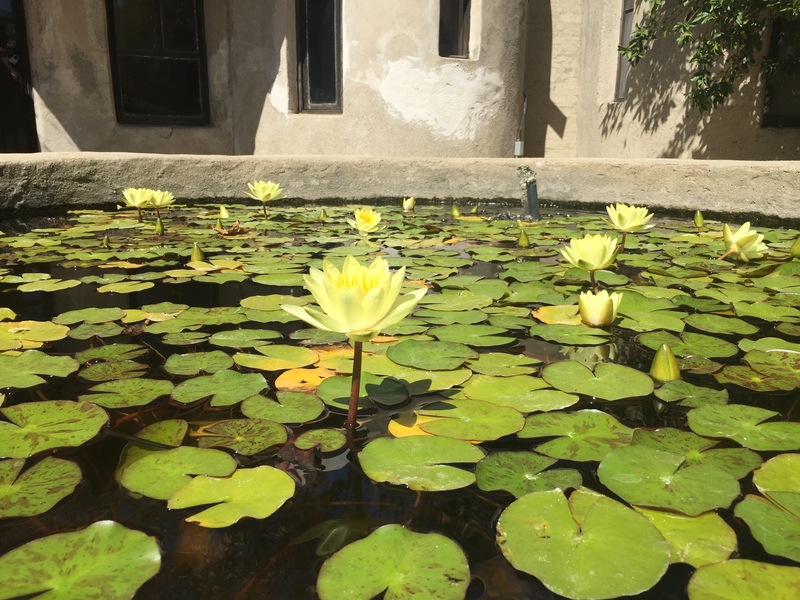 Blooming lotus in one of the gardens near the guest homes of Lummis House. Our next stops were Sycamore Grove Park, then Busch Gardens. We enjoyed some nature and spectacular views from both locations. We were even able to hike down some of the staircases and enjoy some of the original benches and planters at Busch Gardens that were there from when this was private land owned by the Busch family. After leaving the Gardens, we embarked on what for me was the most difficult leg of the ride. By this time, I was dehydrated and exhausted from the heat. We rode for several miles along the river, which had a steady incline and virtually no shade. We then rode by the Rose Bowl and came across a steep dirt path which required us to carry our bikes. I felt nauseous and was worried I was going to pass out. I thought there would be water stops along the way, so I didn’t pack nearly enough. I became concerned I wouldn’t be able to finish the ride, but luckily pushed through! View from Busch Gardens, with other explorers exploring. Mary and I finally made it to the Devil’s Gate Dam in Pasadena, along with the other Explorers. No water poured through the dam or gathered in the reservoir due to the drought. The dam was also blocked off to pedestrians, so we were unable to climb down and see the iconic devil’s head rock. Regardless, we were grateful for resting in the shade for a moment! The ride made its way to Der Wolfskopf in Pasadena for some much needed bratwurst and beer. The ride from the dam to the sausage house was entirely downhill, and we were so glad that it was! Mary and I were spent by the time we arrived. I was too dehydrated for the beer, but the brat was just what I needed. Of course, we took the gold line back to the subway to get home. Riding back from Pasadena was out of the question after the ride we just did! Can you tell we are sweaty and exhausted? Because we are! This was such an incredible ride. Every portion of the ride was an area I’ve never seen before on bike, and only familiar with a small portion of the Pasadena leg of the ride by car. I know for next time that I need to bring more water and not plan on filling up at any of the stops. 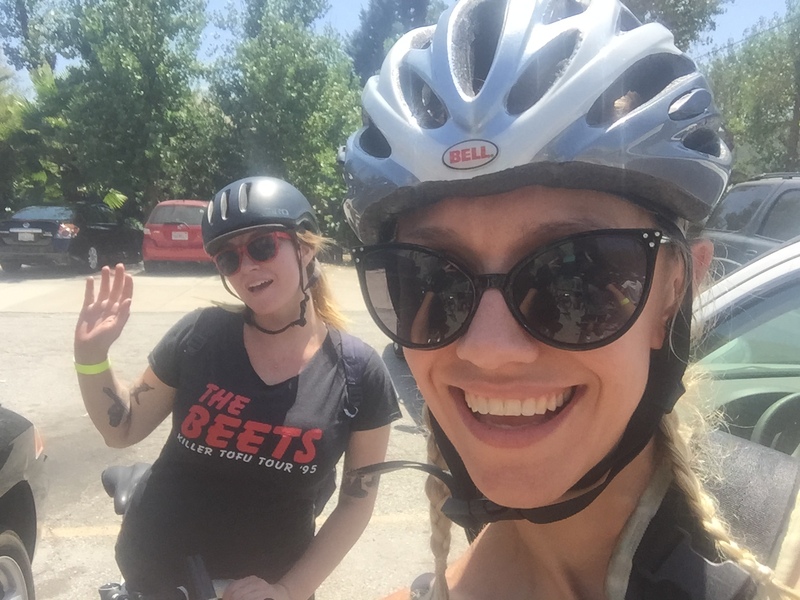 I can’t wait for the next LA Explorers Club ride, and I suggest you check it out too!